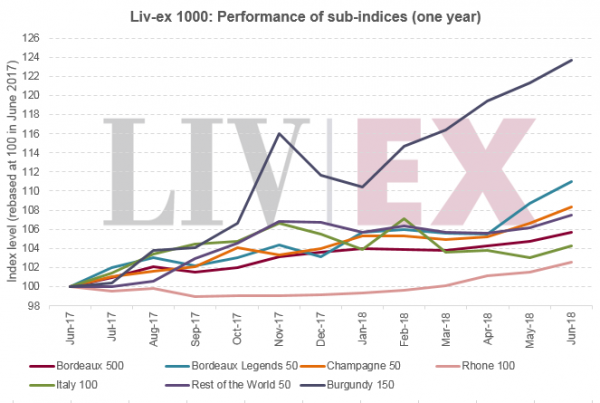 “Burgundy prices have risen relentlessly in 2018,” according to Liv-ex, which says the upward trend has more than reversed the blip experienced by the region at the end of last year, when the index was dragged down by price drops for some key wines. The region has greatly outperformed all others over a one year period. The Burgundy 150 Index, which tracks the prices of 15 top wines in the area, is up 23.7% over 12 months, and 10.7% year-to-date. All other regions have seen gains over the last year, although none match those seen by Burgundy. The Bordeaux 500 is up 5.7%, while the Rhone 100 has risen just 2.5%.